Offers support, professional development and fun networking opportunities! We will have free events throughout Massachusetts and hope you can participate in an event in your region. Young professionals identifying hydric soils. Young Professionals Committee Meeting, Skyroc Brewery, Attleboro, November 2017. Young Professionals Committee Meeting, Jack's Abby, Framingham, January 2018. 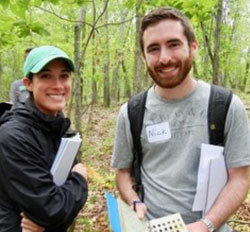 MACC's Young Professionals Committee has been created to provide support, professional development, and networking opportunities to individuals who are new to the environmental profession or new to conservation commissions. Quarterly events will provide opportunities for young environmental professionals to meet their peers and MACC members. The networking events will allow committee members to develop a better understanding of the Wetlands Protection Act, Conservation Commissions, different techniques used in the field, career paths, or just meet new people. There are no admission fees for any of the Young Professionals meetings in 2018. We are Conservation Commission members and young, dynamic environmental professionals in consulting, governmental, legal, and other environmental fields who are looking to make a difference in our careers and our communities. We strive to make our events both fun and educational. We mix networking with wetlands training, brewery tours, kayaking, beer tasting, hikes, and other events. We will have free events throughout Massachusetts and hope you can participate in an event in your region. · Curtis Thalken, Senior Vice President / Chief Operating Officer, Normandeau Associates, Inc.
· Tyler Parent, Fisheries Scientist, Normandeau Associates, Inc.
Where: Aeronaut Brewing Company, 14 Tyler Street in Somerville, MA from 6-9 pm. Contact Nick Wyllie at (508) 223-2222 ext. 3145 to register or if you have any questions. We welcome new members to the Young Professionals Committee from conservation commissions, consulting firms, newly graduated students, and representatives from other associations including the LSP Association, Environmental Business Council, AMWS, BBA, and SWS. Bring a friend and see you on May 9th! If you have suggestions for professional development topics or locations for meetings, email the co-chairs: Nicholas Wyllie or Hung Pham. We hope to see you at a Young Professionals event in 2019! Hung Pham (Committee Co-Chair), Massachusetts Department of Transportation.